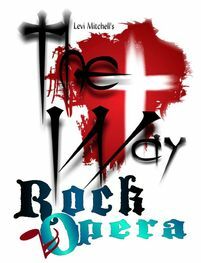 The Way is based on a realistic fictional story about a teen aged boy “Jeremy Nelson” in high school and his Christian Family “Pastor Gregory Nelson and Mrs. Nancy Nelson” who lose their way along the way yet, find their way back to Christ in this Rock-Opera journey. The scene is set in rural America, the Nelsons are a low income family, Jeremy attends public school and a his Father has just opened a brand new church. Amidst the struggles and cares of everyday life, ministry, drugs, abuse, peer pressure and poor choices, just to name a few of the challenges that are portrayed in this story to find “The Way" will compel the viewer to reflect on his/her own life and choices. This a FREE event is geared for teenage viewers and adults. Written by Levi G. Mitchell, a 13 year old boy , who is also playing the lead role as “Jeremy Nelson” in this Rock-Opera. Levi’s passion for Christ and talent for music have inspired him in many ways. Encouraged to touch the life of teens in song, he wrote the song “ The Way” in 2009. This song provoked the Rock-Opera “The Way”.